Huge thanks to quack-duck for that one! Bottle looks complex, but good. Beer in the glass zippy, nice head. Starts mild, malty, more and more hoppy, dry, grasy. Light bitter background. Finish well balanced, soft malty, still grasy-hoppy notes. Not bad! 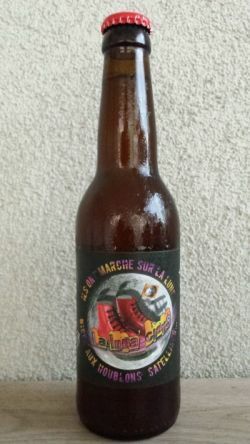 bottle from Bièrerie. Golden yellow with a tall white head. Cirtrusy hop aroma. Medium-bodied, solid malty base supporting and delivering beautiful aromatic hops, slightly piney but mainly fruity with cirtsu and mango flavours, perhaps a touch of passion fruit. Trübes dunkelgoldenes Bier mit ordentlicher Schaumkrone. Geruch fruchtig, hopfig, blumig. Geschmack ebenfalls leicht fruchtig hopfig, blumig. Bottled. A hazy dark golden beer with a fluffy off-white head. The aroma has notes of straw, hops, and fruits. The flavor ia sweet with notes of fruits, malt, and dusty hops, leading to a bitter finish.